Esteban Alarcon is 5’7” on his license, so we’ll go with that. As an academically ambitious senior, semi-professional wakesurfer, jazz musician, Copy Editor, H.o.P.e VP of Communications, and medicinal marijuana activist, Esteban has a busy schedule. Aside from maintaining his 4.29 GPA, the versatile teen will spend up to eight hours a day on the water, training for his next national tournament. 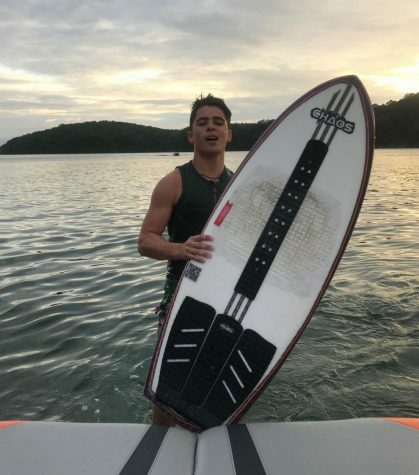 To combine his passion with helping the community, Esteban takes part in Wake For Warriors: an organization teaching veterans how to wakesurf and enjoy life. A large influence on Esteban’s character comes from his home country, Colombia. Visiting the South American about every year, the teen endulges himself in his culture, the food, and family while being surrounded by the familiar spanish dialect from Medellin, Colombia he grew up speaking. The teen hopes to one day merge the Colombian and American economy through the growing medicinal marijuana industry in order to help people. Today, Esteban works towards getting into the University of Georgia with a major in International Business and a pathway towards Dental School.